Launch of Open Access week at Bangor. Get paid to help us make your library the best place it can be. The library website is currently being updated. Please e-mail library@bangor.ac.uk if you require any assistance. The Archives will be closed for 2 weeks over the Summer period between the 30th of July until the 10th of August 2018, re-opening 13th August 2018. Deiniol Library is open 24/7 from 2 January until 21 January 2018. Hello to Simon, Alec & Julia. Upcoming projects will be shared on their Facebook page. From 8:30am on Monday 6th November the Main Library and will be open 24/7. Please note that to access the Main Library after 9pm, you will need to swipe in using your Bangor Student card. Help spread the word by using #BULibrary247 with any pictures taken of you in the library! If you have any question or queries, please get in touch with us via Social Media, Online Chat, Email or call us on 01248 382981. You can also speak to our helpful, friendly staff in branch. We have changed the way electronic articles from the British Library are delivered. For further information and guidance, please consult our DRM Lite page or contact us by email at ill@bangor.ac.uk or by phone on 01248 383048. Newer issues of journals will now have a slip on the cover asking you to tick a box every time you use the journal. Your cooperation would be much appreciated, as we are doing this to compile an accurate picture of print journals which are actually being used. Polly Wilton, a volunteer with the Archives and Special Collections, has been busy creating an exhibition based on a postcard of Bangor. 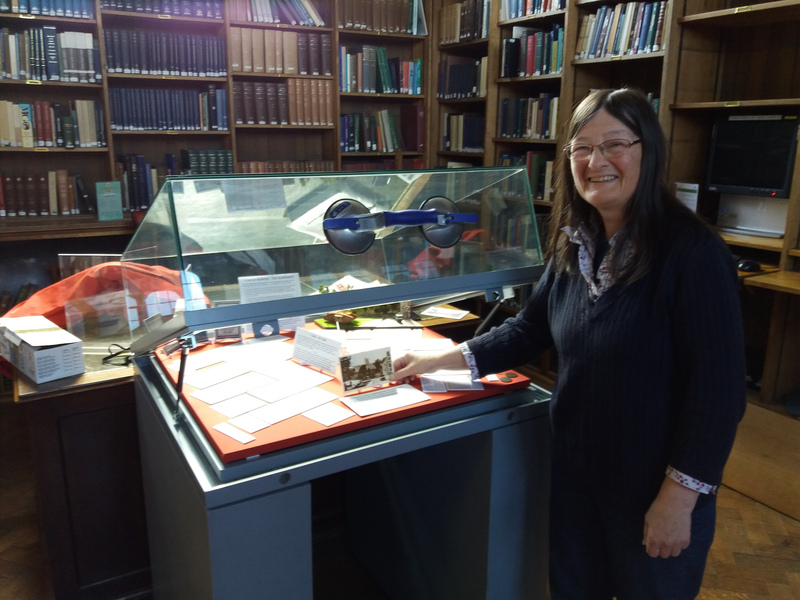 Pop to the Shankland reading room in the Library to view her 3D model which recreates the scene and pick up a leaflet that reveals the story behind the postcard. ..for helping the Library & Archives Service improve our services for students. We will be looking for new library ambassadors for next year, if you are interested, e-mail: libsupport@bangor.ac.uk and we'll send you an applicaton pack in September 2017. Bangor University is currently running a trial (11/10/16 – 30/11/16), for the Health Research Premium Collection & British Nursing Index Full Text databases package. BU staff & students only. We’ve reviewed and simplified our standard loan periods and increased the number of items most library users can borrow at a time. Please remember that all loans are subject to recall, and due dates will be reduced if a borrowed item is wanted by another library user. *Standard loan items which have not been recalled by another user will be auto-renewed for a further 4 week loan period 7 days before they are due (NB auto-renewals do not apply to loans to external borrowers). 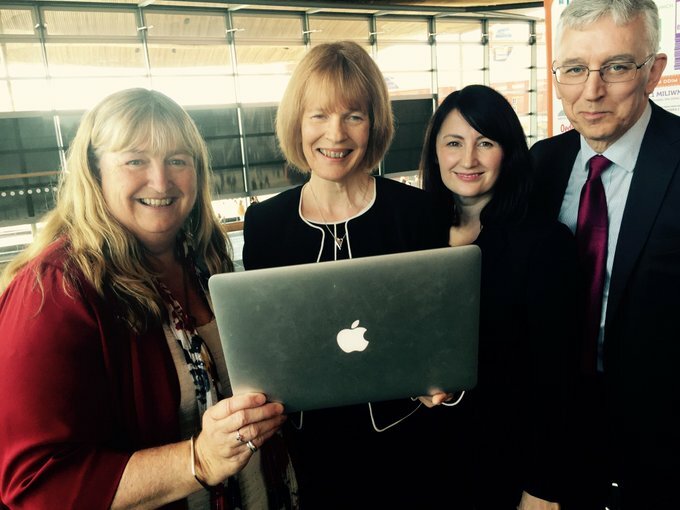 Left to right: Julie James, Minister for Skills & Science, Sue Hodges, Director of Libraries & Archives BU and chair of WHELF, Mandy Powell, Head of CILIP Cymru and Hywel James, Principal Librarian of Gwynedd Library Service. Your New Library Search is now live! The new Library Search facility is now live! Click here to explore our new library search page. With Library Search you can not only search for items physically in the library like books print journals and DVDs, but you can also search for online resources like full-text* journal or newspaper articles. This exciting new feature provides researchers and students with more ways to discover resources. Starting from one article, the citation trail will find other materials that cite that article or are cited by it. If the item you’re looking for is not available here, simply click the ILL link and all the details will be automatically uploaded and your request will be processed. Standard loan periods for undergraduates will be increased from two weeks to four weeks. We will automatically renew your standard (4 week loan) items, up to fourteen times – as long as they are not recalled by another person. The new search is live!, so visit our FAQ for all the latest developments and answers to any questions you may have. We aim to have no disruption to services, but if you experience any problems, please get in touch. *Some of these features will only be accessible when you have signed into your Library Account. The sign-in will use our usual Bangor user-id and password. Recalls - What you need to know! All library stock is loaned on the understanding that items may be recalled if required by another user. The fact that you have not yet finished with a book is not acceptable as a reason for not returning it when recalled. Get the book back to the library as soon as possible. Consider posting the book back to us if you are away on placement and not able to return in person. If you miss the new return date, you will incur an increased overdue charge of £1 per day. More importantly, you will be inconveniencing another library user who needs access to our finite library resources. Recalls apply to all users and all items – loans which may have been extended to cover placements and field trips can still be recalled. You must ensure that you are able to respond promptly to recall notices at all times. University staff, who have completed more than 35 years of service to the University, were honoured at a ceremony which took place on 24th February. Alan Hughes, Collections and Digital Developments Assistant, is pictured receiving his award from Lyn Meadows, Director of HR. Some users have been experiencing problems while trying to access journals from Oxford University Press. The problem is a certificate error that seems to block access to the journals, but can be overcome if you follow these instructions. 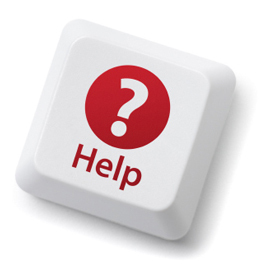 If you have any problems or questions, please contact us at eresources@bangor.ac.uk or 01248 388027. If you live in or around Bangor you may want to continue using the Library and we can arrange for you to have a library card to continue to access the University’s library. The Alumni borrowing entitlement is 6 items on loan at any one time. Please note that some categories of stock are not available for borrowing by associate borrowers, such as short loan items and electronic access is not included. Number 1 Library in Wales! Results from the Times Higher Education Student Experience Survey 2015 show that our libraries have been rated top in Wales for ‘good library and good library opening hours’. Our score of 6.5 was also the second highest score across the 113 institutions surveyed, and puts us at equal 5th in the UK. Bangor University’s Director of Libraries and Archives, Sue Hodges, said "We are delighted by the outcome of this survey. Library and Archives staff have worked incredibly hard to improve services and facilities, and it is rewarding that students have acknowledged how we support teaching, learning and research, and also appreciate our extensive opening hours. We will continue to work closely with students and the Students Union to improve our services and plan for the future. The Library and Archives Service is pleased to announce that Murphy Parys has won our recent poster competition. Murphy is a first year undergraduate in the School of Creative Studies and Media studying Creative and Professional Writing. The competition was run as part of the ‘Love Your Libraries’ campaign which was launched on 26th January at the Santes Dwynwen Lecture. All of the entries were delightful and creative, so a big thank you to everyone who took part. 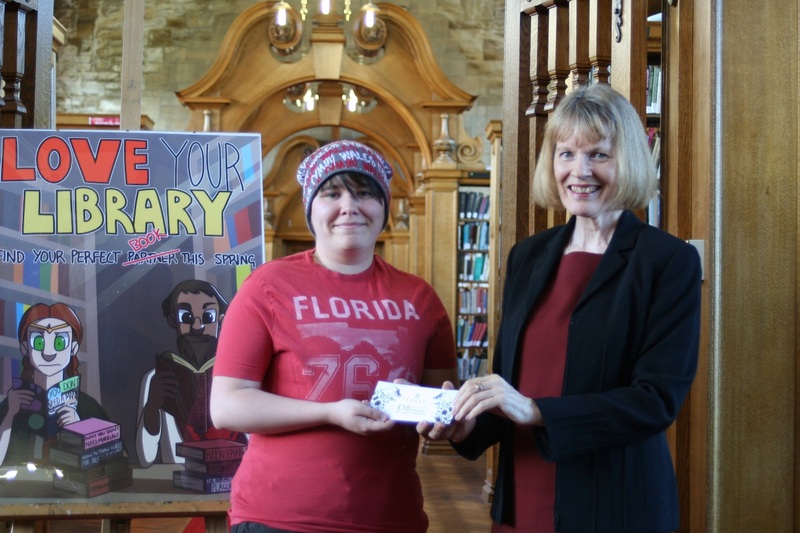 Here is Murphy being presented with the winning prize, a voucher for a meal for two in the Teras Restaurant, by Sue Hodges Director of Libraries and Archives. 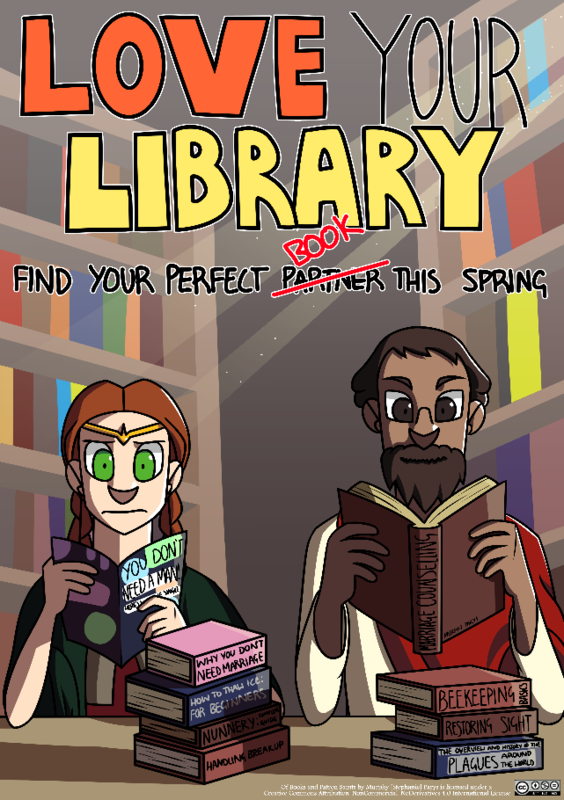 The poster competition asked entrants to create a poster on the theme of Santes Dwynwen or Saint Valentines within the theme of ‘Love Your Libraries’. Murphy said of her design ‘I was thinking about Santes Dwynwen and Saint Valentine and what they represent. I thought about them bothresearching in the library and Icame up with the idea that they would be looking for books related to their lives’. And here is the winning entry titled 'Of Books and Patron Saints'. The Development and Alumni Relations Office offer a range of services and benefits for Bangor Alumni. How the Library can support you during revision and exams? Main Library and Deiniol Library are both open 24/7 until the end of May and Normal Library is open until late on weeknights as well as Saturday afternoons. See our webpage for full details of opening times at all our sites. Service desk staff – here for you! The Academic Support team are on hand for in-depth help with searching our databases, problems with ebooks or any resources, referencing software and more! See our webpage to find the Academic Support Librarian for your college. Not in the library but need help? You can instant chat with us Monday-Friday, 9am-5pm. Look out for the red “Ask-the-Library’ banner on our webpages and start chatting using the widget! There are vending machines at Main, Deiniol and Normal which serve a range of hot and cold drinks as well as snacks. Each site also has a drinking water fountain. We don’t allow hot food in any of our buildings due to the extra rubbish and odours hot food can produce. Also, please don’t take hot drinks or any food into the reading areas, but use the designated eating areas (by vending machines or sofas in foyers /corridors) instead. St.David is the Patron Saint of Wales, we celebrate his life on the 1st of March – St David’s Day- every year. 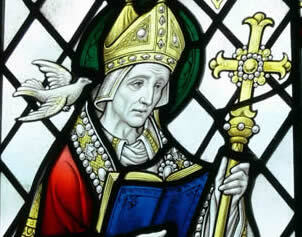 St David was born sometime in the late 5th century, to a nun called Non who had been raped by Sant, king of Ceredigion. David accompanied by Padarn and Teilo made a pilgrimage to Jerusalem where he was made archbishop by the patriarch there. This account of his life was written by Rhigyfarch, the son of Sulien, bishop of St David’s, towards the end of the 11th century. The legitimacy of the account is questionable as it contains much that is legendary. Many miracles have been attributed to St David the most celebrated of which was performed when he was preaching at the Synod of Llanddewibrefi – a dove landed on his shoulder shortly before the ground rose beneath his feet, enabling the crowd to see and hear him. Exam time can be a busy period! Don't forget you can manage your library account online and over the phone. 'Sign in ' to check on current loans and holds. This is also where you can check their eligibility for auto-renewal. Problems with overdue charges or need more info? The Main Library and Deiniol Library can answer your questions as well as take debit/credit card payments for overdue charges. This film has been produced for HE libraries in Wales to encourage students to use the facilities and services on offer to help them make the most of their studies. Enjoy! The University has signed up to the Copyright Licensing Agency (CLA) licence that permits the digitisation of print copies of journal articles and book chapters published in the UK (with some exceptions). To take advantage of this service, please complete a digitisation form. Due to the CLA's requirements, forms must be completed in full before processing can take place. Please contact Sarah Owen if you have any further enquiries. Are you a full-time undergraduate? Would you like to have access to another higher education library during the summer break? Through the SCONUL vacation access scheme, Undergraduate students at UK Universities will normally be granted reference use of other UK higher education libraries free of charge during the vacations of the host institution. Most libraries allow access on production of your Bangor University library card, although it is advisable to contact the library you intend to visit beforehand to confirm that they are open and have no additional local requirements or restrictions. Contact details of libraries in this scheme can be can be found via the list of participating institutions. Please remember that this is a reference scheme and does NOT provide for borrowing, nor for access to electronic sources of information. Whilst higher education librarians will do their best to honour this scheme, temporary building work or other disruptions may cause libraries to withdraw from time to time. Admission to other libraries is always at the discretion of the Librarian or Director..
All comments and feedback on the usability, navigation, design and content of the website are actively encouraged. 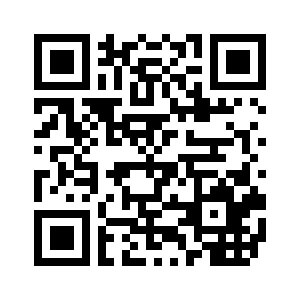 Please fill in the online feedback form with your feedback.